A big thank you to all of the Geographers and supporters thereof who converged on the Tampa Convention Center and Marriott for AAG last week, and a big apology in advance to all the ones who I met that won’t hear from me for a little while as I’m busy catching up on work and otherwise getting my life back in order. I had grand ambitions to do some work while in Tampa, but if you’re reading this you can probably take a wild guess as to how that turned out. As anyone who’s been to a conference like it knows, everyone’s too busy being constantly distracted in order to really accomplish anything other than make new connections and pray they remember you. 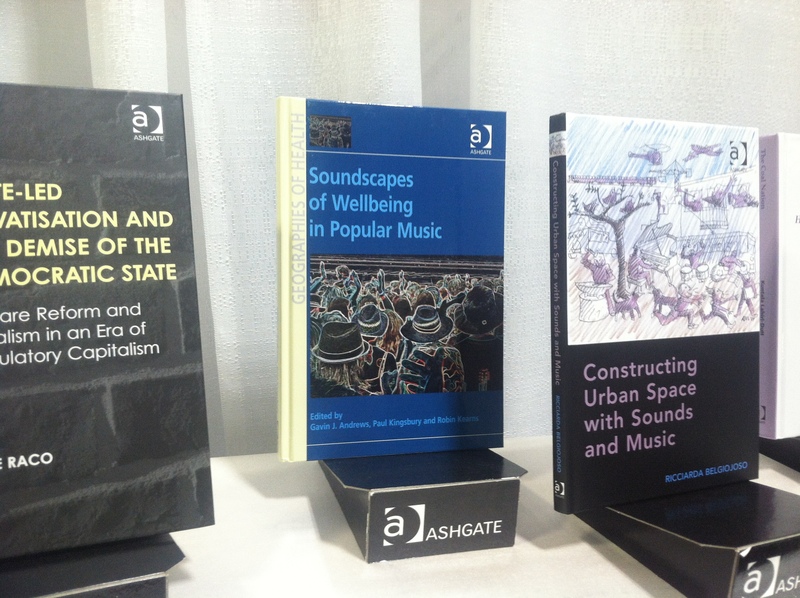 That being said, I was excited to see the book with a chapter I contributed displayed prominently at the Ashgate table in the exhibitors’ hall in such good company. I would love to give Tampa proper some attention here*, but in the interest of time, I’ll skip right to the point. A few months ago, I posted cryptically about some antique postcards that came into my possession. Where the postcards are from will hopefully one day be under an organized-enough umbrella to present here, but for now, let’s have a quick chat about (re)photography. The term “rephotography” (alternate “re-photography” or “(re)photography”) didn’t originate in Jason Kalin’s 2013 article (found here), but he did bring the scope of its uses to my attention last year. Considering how easy the internet has made it, our culture can barely digest content without (re)contextualization. This is both a good and a bad thing, but acting on what I hope is a good manifestation of it, I decided to set out on foot from the Tampa Convention Center to try to recreate one of my the postcards myself. The over-friendly hotel concierge** told me the Davis Islands were located a walking distance from the downtown area, though strategically disconnected from the Convention Center area proper. I suppose they didn’t want legions of drunken Lightning fans stumbling over from the Forum into their bars (which are located way too deep into the island for the casual ambler). Not perfect, but I would have needed to defy death and stand in the middle of Bayshore Boulevard in order to get a more accurate recreation of the original artist’s perspective. 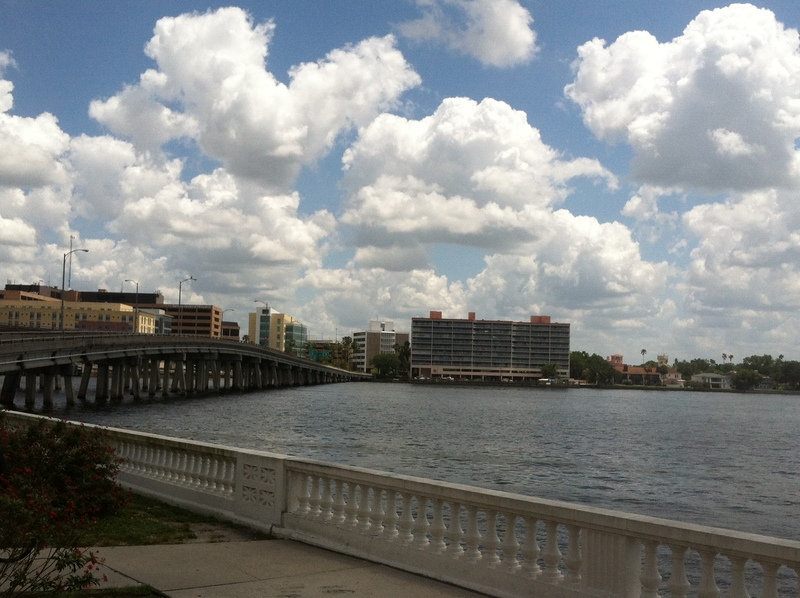 Also, the bridge from Hyde Park over to Davis Islands has been remodeled, and the Davis Island residential areas of 2014 are a far cry from that of the pre-War era. Obviously, the hospital and adjacent office buildings were not there when D.P. Davis*** imagined this crazy project before building it and disappearing. From what I can tell, the fencing by the harbor has largely retained its character, and the vegetation nearby in the foreground is even quite similar to the classic depiction. The bright yellow building depicted on the postcard can be seen at a distance to the right of the hospital today, which helps highlight how the postcard image (obviously painted to sell the city and the Davis development) is based on an off-scale interpretation. 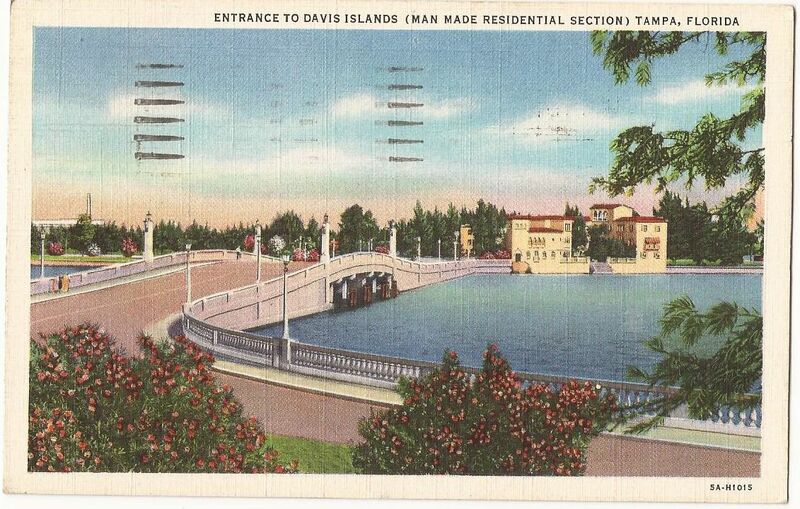 I would need to dig deeper and find archival photographs of Davis Islands in order to determine what exactly was misrepresented, and thanks largely to the conference that brought me to Tampa backing up my workload, I have no time right now. At least there’s always Google, right? * If you’re in Tampa, though, and looking for great places to hang out, look no further than New World Brewery (Ybor City), The HUB (Downtown and if you’re okay with smoke), and the Independent (Seminole Heights, next to the wonderful money-pit Microgroove record shop). Full disclosure, we didn’t make it into the Independent since our ride downtown was leaving, but you could just tell it was awesome. ** If you’re wondering if that’s a reference, the answer is yes. *** If you want to read one of the most fascinating accounts I’ve found about the mysterious Florida land developer, check out this history thesis by Rodney Kite-Powell. It helps explain his legacy and bizarre disappearance. This entry was posted in AAG, Cartography, Re-Photography, Research and tagged AAG, Association of American Geographers, d.p. davis, davis islands, florida, images, imagined geographies, jason kalin, photography, postcards, rephotography, rodney kite-powell, tampa, Tampa Bay, tampa convention center, university of southern florida, visual methods by Tyler. Bookmark the permalink.